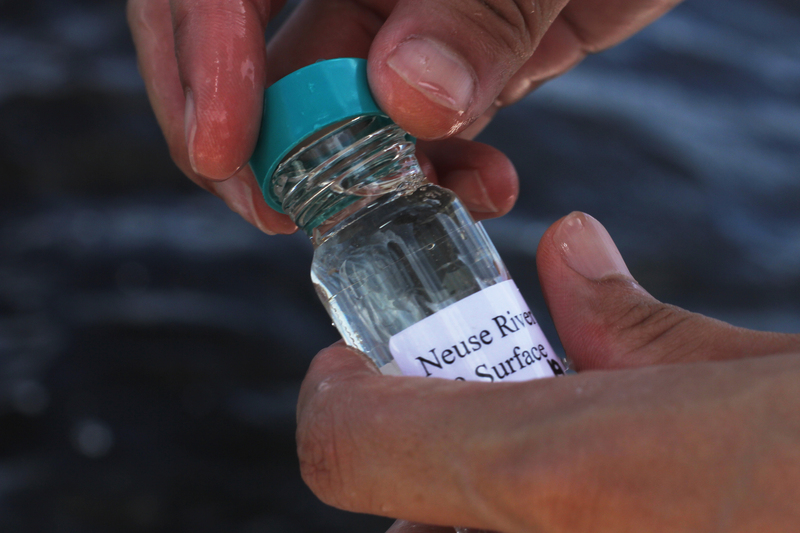 Marine scientists at UNC are taking a new approach to figuring out why and how microalgae blooms occur in the Neuse River Estuary. Weida Gong collects a water sample for sequencing from the Neuse River on September 19, 2016. An offensive stench fills the salty air above the lower part of the Neuse River Estuary near downtown New Bern. It’s the type of smell that hits you slowly – and then all at once, stinging the inside of your nose. While the smell invades your olfactory senses, the cackles of birds rings through your ears. Hundreds of seagulls zoom in circles just above the surface of the water. “Sure sign of a fish kill,” says Jeremy Braddy, a researcher from the UNC Institute of Marine Sciences, staring at the mass of birds swarming like vultures. “How often does this happen?” asks Weida Gong, another UNC researcher, who just moved here from China. “A couple times a year,” Braddy says. Fish kills are one repercussion of a phenomenon called eutrophication. When too much nitrogen enters a water body, algae blooms form, producing a suffocating effect on the water and the fish in it. A textbook example is the Neuse River—part of the Albemarle-Pamlico estuary system which serves as a nursery for 90 percent of commercial seafood caught in North Carolina, according to the NC Division of Tourism. Neuse River. Pollution. Fish kills. You’ve heard this before. For the past several decades, environmentalists have voiced concerns about it, journalists have reported on it, and marine scientists have looked for answers to why and how this happens. But now some scientists are taking a new, cutting-edge approach to understanding exactly what’s going on in the water. Gong, on the other hand, will use his samples to determine what’s happening inside the tiny microscopic organisms known as plankton that inhabit this water—on a molecular level. Gong isn’t talking about measurements that can be performed in most science labs or on your average laptop. To sequence genetic information from the environment, he will take his samples from the lab to the UNC High-Throughput Sequencing Facility (HTSF) on the main campus of UNC-Chapel Hill to be sequenced using new, cutting-edge technologies. He will then require the use of one of the largest computer clusters in the US made for UNC researchers by UNC Research Computing to analyze these sequences. While the measurements collected by researchers in the Paerl lab illustrate the overall quality of the water, they don’t provide as much information about specific types of plankton that are present in a given area — and those specific groups may have important ecological consequences, according to Adrian Marchetti, a UNC expert on the genomics of marine phytoplankton. Gong, originally from China, became interested in water quality during his undergraduate studies at Xiamen University — where he studied zebra fish in the estuaries of China’s Fujian province. While there, he became fascinated by the harmful algae blooms within the estuaries, as well as Lake Taihu, the country’s third-largest freshwater lake. “These blooms affect the drinking water for millions of people and really hurts the economy,” Gong says. Lake Taihu is another location where Hans Paerl conducts research. His foundational research paired with the lake’s environmental conditions make it an ideal place for Marchetti and his team to do a study. If they can obtain funding, learning about this lake could be very useful, Marchetti points out. Sequencing enables researchers like Gong and Marchetti to look at these organisms from a new perspective. “The patterns in taxonomy we obtain through genetic sequencing are very consistent with what people see when they look down a microscope,” Marchetti says. While molecular sequencing provides a sort of universal alphabet, interpreting the sequences of a dinoflagellate (a particular group of plankton well known for their ability to form harmful algal blooms) is similar to interpreting a foreign language. Humans are diploid, meaning we have two copies of our genome, which contains 23 chromosomes. But most dinoflagellates are thought to be polyploid—they have many copies of their genome—that’s one reason they’re so large. Approximately 4,000 miles from the Neuse River Estuary, off the coast of Oregon and Washington, 500 miles of cable runs along the ocean floor, powering a robust array of scientific instrumentation. A massive project of the Ocean Observatories Initiative, the Cabled Array is the first U.S. ocean observatory to span a tectonic plate (the Juan de Fuca plate) and in many ways, it represents the future of oceanographic research. A group of researchers from the Monterey Bay Research Institute are developing environmental sample processors that can plug into the Cabled Array and work in real time. They are able to take in cells from the water column, extract DNA, and see whether certain microorganisms, like harmful algae species, are present using molecular probes. “Then that information is transmitted from the mooring to a satellite to a computer where the researcher can see it in real time—straight from the water,” Marchetti explains. Engineering instrumentation that can withstand prolonged periods of time in the open ocean is a challenge that researchers are still dealing with. And while Marchetti’s lab is not working on that particular problem, he hopes that when that data is delivered in real-time, straight from the ocean, he and his team will be ready to translate it. Adrian Marchetti is an assistant professor in the Department of Marine Sciences. Weida Gong is a PhD candidate in the Marchetti lab.